Last week, the basketball rumor mill exploded with stories about how LeBron James said he would take a pay cut to play on the same team as Carmelo Anthony, Dwyane Wade, and Chris Paul. Although it’s still far from imminent and we still have an entire postseason to get through before anything like that happens, more fuel to the fire of that gossip has been added in recent days. 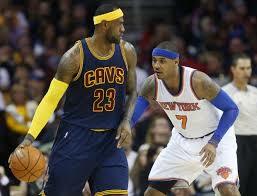 There have been some rumblings that Melo is considering a move to the Cavs this Summer. He would have to waive his no-trade clause for that to happen, but playing on a terrible Knicks team isn’t exactly a great way to spend the rest of a career and they don’t appear to be even close to contending any time soon. Sam Amico of AmicoHoops.net wrote a piece on Sunday about the possibility of Anthony coming to Cleveland. Amico points out in the article that it’s all speculation and not to be taken as gospel, but former NBA player and ESPN analyst Jalen Rose also said Melo is “already mapping out plans” to head to Cleveland. That video was taken on March 25th, 2016 when LeBron appeared at an event sponsored by Samsung in New York City. If LeBron doesn’t want people speculating about his future with this group of players in Cleveland and if he wanted to show that he is in total unity with his fellow Cavaliers, all he had to do was say the name of a player or players who are currently on his team. Stuff like this gives more life to the rumors. Maybe thats what he wants.